The Real Junk Food Project Edinburgh is a proud associate of the charity of the same name, founded in Leeds in 2013, and now an expanding and exciting UK-wide network of cafés and communities. They intercept food before it goes to landfill. They cook it. They serve it to all comers on a Pay As You Feel basis. Working with supermarkets and smaller retailers, farms and other producers, and consumers they try to reduce waste at all levels of the supply chain. The Pay As You Feel (PAYF) policy encourages a mixed demographic to be involved in the project, allowing the food poor and those with means to pay for their food to eat together, developing a sense of community and awareness of local food insecurity. The aim is that this will also get people thinking about the value of food as a resource in a different way. TRJFP Edinburgh was set-up in January 2015 by co-directors Donna McArdle, Aileas Pringle and Charlie Hanks. They held their first pop-up event at the Union of Genius in March. Along with several one-off events, we have recently been running weekly pop-ups at the Union, Breadshare and the Edinburgh Larder Café. The staff are volunteers and they always welcome more, providing training opportunities and cooking workshops. The team hope in the long-term for such projects to be commonplace, creating training programmes to help local communities set up their own community cafes based on a similar ethos. Eventually, of course, there will be no need for the project to exist at all, with waste effectively designed out of the food system. 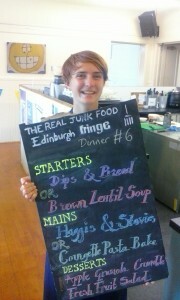 Find out more on the Real Junk Food Project Edinburgh website and Facebook.